Zhao Kuangyin (927-976) - After the fall of the Tang Dynasty and the breaking up of China into many states, it would take a military leader to unify the country once again. And that leader was Zhao Kuangyin. 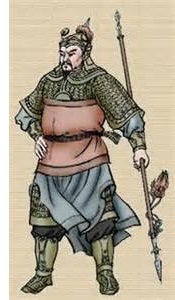 He arose out of the kingdom of Hóu Zhou (meaning "Later Zhou" to distinguish from the original Zhou Dynasty) and was the son of an able general in his own right, Zhao Hongyin. But it was Zhao Kuangyin's military prowess that brought him to the attention of Emperor Shizong. The emperor appointed him commander of the cavalry and he was instrumental in winning the Battle of Gaoping, which repulsed an invasion from the north by a combined army of the Northern Han and Khitan Kingdoms. This victory led to his promotion as the chief commander of the emperor's army. And then in 959, the emperor died prematurely leaving only a seven year old son as his heir. The timing was critical because it was rumored that the Han and Khitan were preparing for a second invasion. He led the army to the frontier for another counter-attack, where his troops anointed him emperor. It is rumored that he had no plans of becoming emperor, but because of the precarious situation, his family and allies instigated the change. Incidentally, this is considered that last usurpation of power in China's history. The second invasion never came, and Zhao Kuangyin marched back to the capital as the new emperor. However, he demanded that the former child-ruler and his mother not be harmed, and they were allowed to exit the palace peacefully. Zhao Kuangyin became Emperor Taizu and founded the Song Dynasty. During his reign from 960 until his death in 976, he conquered the Nán Táng (Southern Tang), Hóu Shŭ, Nán Hàn and Jīngnán Kingdoms, largely reuniting China.